If you rely on fast food to feed your family because it is cheap and convenient, have we got a cookbook for you. Author Erin Chase shows you how to cook delicious and inexpensive food all for under $5 in “The $5 Dinner Mom Cookbook.” To win one of two signed copies we are giving away, see below. It became my “job” to create and execute a plan in which I spent less of my husband’s hard-earned money. I considered the amount saved each week at the store to be like my earning. That summer, I implemented a number of strategies to help me save more money at the grocery store. I found great pleasure and felt fulfilled spending less at the store, putting coupons to use, and having a plan for dinner each week. In the cookbook, Chase teaches you about strategic grocery shopping, couponing, and meal planning. She includes 200 recipes of nutritious meals with cost breakdowns and frugal facts. The recipes are for a family of four, but you can double them depending on how many mouths there are to feed. Feeding your family well-balanced meals for less is a possibility! If you’d like to win a copy of “The $5 Dinner Mom Cookbook” leave a comment letting us know what your go-to weeknight meal is. Winners will be revealed tomorrow, June 22. You can also win one of 8 copies we are giving away as door prizes at Frugal Festival Food! on June 25 in LA or purchase the book on Amazon for $9.86. If you’re searching for tasty, money-saving recipes, you’re in luck. Gooseberry Patch sent us their “Money-Saving Recipes“ cookbook. To win one of two copies we are giving away, see below. If you are looking for some delicious, budget-friendly recipes for family meals, you’ve come to the right place! The 127-page cookbook is tiny, but packed with delicious recipes for breads, desserts, main entrees, soups and salads, and sandwiches. The small size of the book is convenient as it’s not flimsy and you can cart it around the kitchen easily. Each recipe comes with an introduction that includes thrifty tips. One of my favorite things is that most of the recipes are one-pot meals. I love cooking, but not doing dishes. This makes clean up a breeze. How does Pizza Mac and Cheese sound for a hectic weeknight when you have to pull dinner together fast? Or Tomato-Beef Stew for a homey weekend? If you’d like to win a copy of “Money-Saving Recipes” leave a comment letting us know who does the dishes in your home. Winners will be revealed tomorrow, June 21. You can also win one of 8 copies we are giving away as door prizes at Frugal Festival Food! on June 25 in LA or purchase the book on Amazon for $7.95. In my review, I described how Watson set out to prove she and her husband could eat healthy on a tight budget. In the 235-page book, she shows you can do it too. Watons shares tips and tricks she’s learned, seasonal menus, shopping lists, and recipes to ease into a greener lifestyle. If you’d like to learn how to shop for organic food while on a budget, this book is for you. I asked you to share what steps you’ve taken to save the planet while staying on a budget and this is what the winners are doing. I make my own compost and grow rogue veggies….I just dump my fruit and veggie trimmings into a hole I’ve dug in the backyard, the worms come racing to it and before you know it I have a beautiful spot to plant a seedling! Although, I usually have wild plants sprouting up from this source….spaghetti squash, butternut squash, onions, potatoes, avocado trees, leeks, beets, carrots, tomatoes, peach tree and chestnut trees just to name a few! Sue W. is trying to buy more organic foods. I always compare the prices between organic and non-organic grown fruits and veggies at the store. I’m really surprised when the organic is only a few cents more. It makes me feel really good about my purchase! If you didn’t win, buy it on Amazon for $11.20 or win one of 8 copies that will be given away as door prizes at the Festival in LA on June 25. 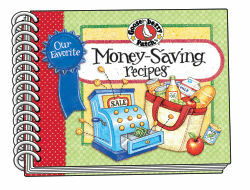 Don’t forget to check out today’s giveaway of “Money-saving recipes” for another chance to win! Think you can’t eat organic on a budget? Author Linda Watson shows you how in “Wildly Affordable Organic.” Not only will you be eating on $5 a day or less but you’ll be helping the planet too. To win one of two copies we are giving away, see below. If you’ve wanted to eat like it matters but felt you couldn’t afford it, “Wildly Affordable Organic” is for you. It’s easy to think that “organic” or “sustainable” are code words for “too expensive.” More people than ever want to eat organic food, and the cost of energy is shooting up like genetically modified corn, but eating green doesn’t have to mean eating up all your money. 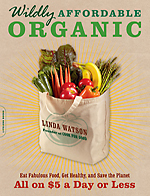 In the 235-page book, Watson eases you into a greener lifestyle with the Wildly Affordable Organic plans. She shares tips and tricks she learned from taking the challenge herself including seasonal menus, shopping list, and recipes. What I like the most about Watson’s method is that she believes in taking it one recipe at a time so you don’t become overwhelmed. And most importantly you will not be deprived. How does red bean chili casserole with corn bread topping for din-din sound? If your mouth is watering and you’d like to win a copy of “Wildly Affordable Organic” leave a comment sharing what steps you’ve taken to save the planet while staying on a budget. Winners will be revealed Monday, June 20. You can also win one of 8 copies we are giving away as door prizes at Frugal Festival Food! on June 25 in LA or purchase the book on Amazon for $11.20. You don’t have to rely on packaged gluten-free foods to enjoy gluten-free meals. That’s the premise behind Nicole Hunn’s “Gluten-free on a Shoestring” cookbook. To win one of two copies we are giving away, see below. Hunn is the blogger behind the Gluten-free on a Shoestring blog, who changed her family’s eating habits when she discovered her second child had celiac disease and was unable to absorb gluten. Whether you’re new to eating gluten-free and fear that the creative foodie part of your life is gone forever, or you’ve been gluten-free for a while and have resigned yourself to lowered expectations and expensive, store-bought gluten-free foods that leave you cold, help is on the way. Everything’s going to be just fine. You’ll find 125 gluten-free recipes for dinners, desserts, comfort foods, and much more. In the middle of the book, there are mouthwatering photos of meals. I got my eye on the spinach pie. Another recipe I’d like to try is for Focaccia bread. Hunn has a tip box on almost every recipe showing how much money you are saving. A gluten-free loaf of bread would cost me $16.47 to buy or $3.77 to make. That’s a $12.70 savings! There are so many bread recipes in here that, gluten-free or not, you’ll still enjoy this cookbook if you’re a bread lover like I am. To win a copy of “Gluten-free on a Shoestring,” leave a comment sharing why you’d like to win this book. Winners will be revealed tomorrow, June 17. You can also win one of 8 copies we are giving away as door prizes at Frugal Festival Food! on June 25 in LA. One way to save money on your grocery bill is to cut the amount of meat you consume. 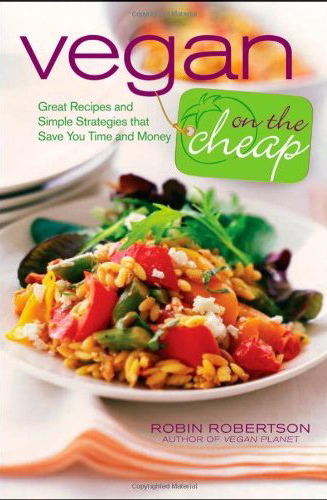 “Vegan on the Cheap,” written by Robin Robertson, will help you do just that with tasty meatless recipes. For a chance to win this book, see below. These days, most of us are on an ever-tightening budget. With skyrocketing food prices, even buying the basics has our grocery bills reaching new highs. A steady stream of newspaper and magazine articles and other media reports suggest many ways to save money on food, and interestingly, “eating more vegetarian meals” is one of the primary suggestions. In her 258-page cookbook, Robertson shares 150 mouth-watering recipes that cost less than $2 per serving. There are chapters on soups and stews, slow-cooker recipes, skillet recipes, desserts and much more. Each recipe includes a cost comparison chart. A 16-ounce jar of salsa costs $2.89 to buy but if you make it, you can save $1.42. The tabbouleh-stuffed peppers recipe was to die for and it only cost me $2 per serving to make. The cheapamole was also delicious and it cost $0.55 per serving. The secret to making the guacamole inexpensive — peas! To win one of two copies of Robertson’s cookbook, comment letting us know what your favorite vegetarian meal is. The winner will be announced tomorrow! If you can’t wait, “Vegan on the Cheap” is $10.34 on Amazon. You can also win one of 8 copies we are giving away as door prizes at Frugal Festival Food! on June 25 in LA. Come early and have your pick of all the door prizes!